Who's in your Dog House? Cape Cod, known for its beautiful beaches, fishing, sea food, artisans and vacations is also a great place to live and work, but what really makes Cape Cod such a great place to vacation is its small businesses and in this instance, The Dog-House Restaurant! Without them, where would you go to pickup some sun screen, groceries or perhaps tubes for the kids or even eating out? And speaking of eating out, Chris and I had heard about this restaurant on the radio. 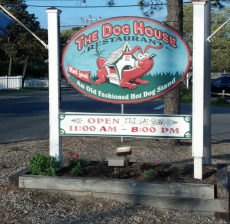 Its advertising says it serves up the best hot dogs on the cape. There are a lot of establishments for fast food, but this one happened to make our day. 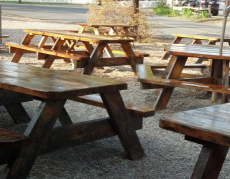 What impressed us were the picnic tables arranged with ample room for patrons to sit and enjoy the out doors. At first glance it appears the parking is not sufficient, but around the corner behind the building was more available off street parking. Now you would not think of a picnic area being clean as a whistle, but every table was spotless. When you ordered the attendant wrote down what you wanted, priced it out immediately and you paid. 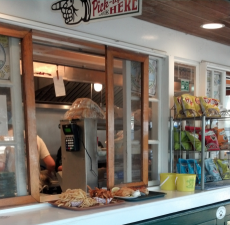 Although we were there to try the famous hot dog, the menu offered a wide variety of additional items such as hamburgers, hand cut french fries, grilled cheese and chili just to name a few. It also included a Kids Menu. The one thing that drew my eye were the consumer awareness notices for allergies and of eating under cooked food, something we see asterisked at the bottom of a menu in fine print, but not here. And speaking of fine print, you should notice there is one free refill of your fountain beverage. 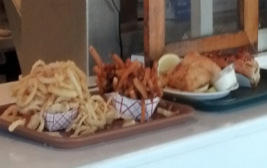 For those who prefer something other than what the Dog-House is known for, there are fish sandwiches Italian sausage, Veggie burgers, Linguica and chicken as well. When you paid you where given a blinking ringer to let you know that your order was ready for pickup. This reduced confusion at the pick up window! While waiting for your order you could choose your table and enjoy the music playing from the out door mounted speaker system. Your buzzer blinked and vibrated which kept the pickup window free from crowds. Where's the catchup, mustard, relish and other condiments? All were conveniently located at a separate kiosk to the left and away from the pickup window. While the Dog-House serves up a variety of food items in an open air environment, it is a fun spot and is located on Lower County Road in Dennis, MA., a block up from Old Wharf and the beach. Chris and I thoroughly enjoyed our bacon/cheese split down the middle hot dogs on a grilled roll and french fries. 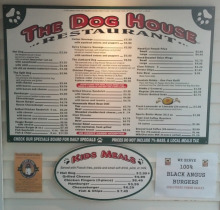 For a menu visit the Dog House web site. The Dog House is a fun place to bring the family for a casual meal while on vacation...We'll be back! Return to Easy Everyday Cooking Recipes from the Dog House.